Face and neck lift surgery is the most reliable and guaranteed way to rejuvenate all areas of the face and neck by tightening sagging skin of the jowls and neck, and restoring youthful volume to the cheeks and mid face. Nonsurgical options for facial rejuvenation have been rising in popularity in recent years for their minimized downtime, but they frequently fall under the criticism of being quite expensive if they are expected to produce a noticeable result, and quite temporary with results lasting sometimes only a few months. There is no nonsurgical procedure that can accomplish the same dramatic and long-lasting result of a surgical face or neck lift, and therefore surgical procedures remain the gold standard for men and women who want real results that last. Many people are worried about having a surgical procedure on the face because they are concerned about scarring, but as you can see these Before & After Photos, the scars are almost impossible to detect within 2-3 weeks after the procedure as long as it is performed by an experienced plastic surgeon. 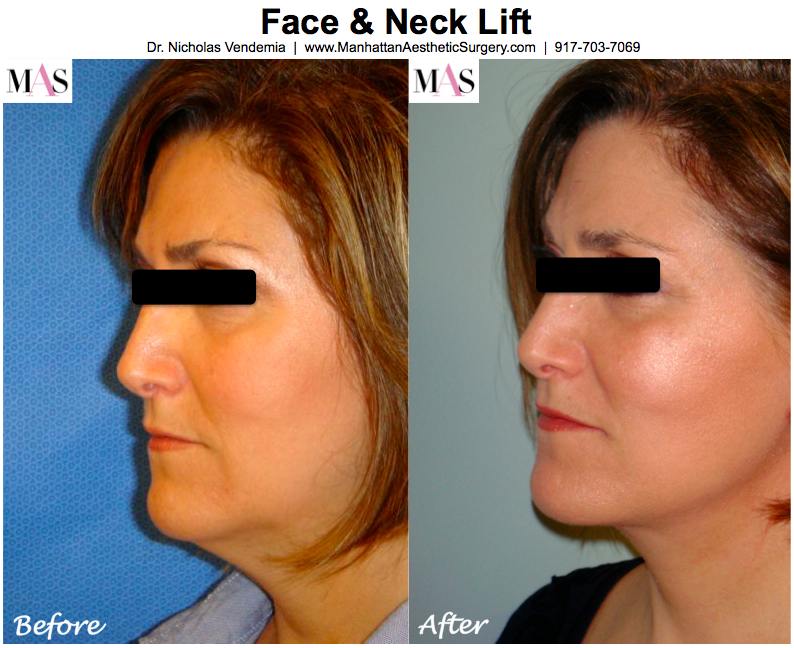 Dr. Nicholas Vendemia performs facelifts, neck lifts, and a variety of nonsurgical facial rejuvenation procedures for women and men in the New York metro area. He is a leading cosmetic surgeon in New York City with a reputation for custom care and beautiful results. Feel free to give us a call at 917-703-7069 to schedule a personal consultation, or send us a message by clicking here. Why is a surgical face or neck lift usually a better option than nonsurgical facial rejuvenation treatments for most men and women older than 45? Nonsurgical procedures can be a great options for man or woman regardless of their age depending on one factor… the neck. If sagging skin or a heavy appearance in your neck is your primary concern, the only option that will give you a satisfactory result is a surgical neck lift. There are no nonsurgical treatments that can produce significant and reliable improvements in the neck. Injectable treatments of the neck will invariably lead to visible lumps and will not provide any lifting or smoothing effects, and most laser skin tightening treatments are simply not powerful enough to produce anything beyond a minor (and usually temporary) benefit. In addition, men and women over 45 years of age usually have lost a critical level of elasticity in the skin, so even significant volume injectable procedures like our famous LiteTouch Liquid Facelift can sometimes fail to provide enough lift for a satisfactory result. Are there any stitches to remove after face and neck lift procedures? Yes, the stitches after face and neck lift surgeries are usually removed in two stages. The first stage happens around the 5th day after surgery when the very tiny stitches in front of the ear are removed. These stitches are so small and inconspicuous that they are rarely noticeable before they are removed, and the removal process is quick and painless. The second stage happens around the 2nd week after surgery when the larger stitches are moved from behind the ear in the hairline. Even though these stitches are larger, they are still very inconspicuous because they are hidden within the hair and can’t be seen by anyone who isn’t specifically looking for them. So even though some stitches will be present for up to 2 weeks, most patients are able to be out and about within 5-7 days after surgery with a small amount of gentle mineral concealer in front of the ear and no surgical dressings of any kind. How important is sunscreen to keep the scars looking good? It is CRITICAL to always, always, always use sunscreen on your scars for the first 12 months after surgery or injury. Sun exposure is one of the leading causes of scar hyperpigmentation (darkening), which could be permanent. The best sunscreens for scars contain zinc oxide, which blocks UVA and UVB rays. If you have trouble finding a zinc-containing brand, use the heaviest sun protection you can find (Neutrogena makes SPF 100). And remember, the suns rays are strong enough to penetrate most clothing and bathing suits, so you should still apply sunscreen even if your scars are covered with clothing. For more information about face and neck lift options, please call our office at 917-703-7069, or send us a message by clicking here. We offer the most innovative techniques and the quickest recovery times in the safest environment possible.